Teach for America announced a national partnership with Sigma Lambda Gamma National Sorority, Inc. Sigma Lambda Gamma (SLG) is the largest Latina-based, multicultural sorority in the United States, with over 150 chapters and alumnae associations across the country. This partnership affirms the leadership and educational contributions of SLG members as well as Teach for America’s ongoing commitment to bringing diverse, talented leaders to the classroom. The goal of the partnership is to help address the disparity of access to quality education, which disproportionately affects Latino students and other students of color. As part of the partnership, Teach for America will attend Sigma Lambda Gamma’s national leadership retreat this summer to connect with campus chapters to create programming for members. Along with Teach For America’s other Latino Greek partners, SLG members will have access to professional development opportunities, including online events, Latino leadership summits, and local workshops. 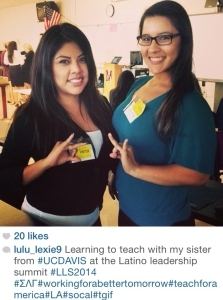 Last year, SLG contributed the largest number of Latino Greek applicants to Teach for America’s 2014 corps. The same year, more than 13 percent of Teach for America’s incoming corps identified as Latino, compared to seven percent of teachers nationally. Currently, more than 20 SLG members are first or second year corps members, impacting students across more than a dozen regions.